Maria is a litigation attorney for Bone McAllester Norton PLLC in Nashville, Tennessee. She strives to do good work for her clients and the community. 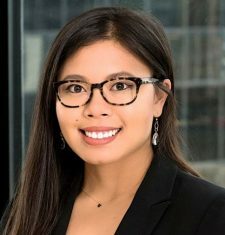 This California native received her undergraduate degree from the University of Southern California and her juris doctor from Loyola Law School, Los Angeles. She previously worked for the firms DLA Piper and Atkinson, Andelson, Loya, Ruud & Romo. Maria left her Southern California roots for the first time last year to follow her husband who is a captain in the Army and a West Point graduate. They are currently stationed at Ft. Campbell and live in Clarksville, TN. Maria was one of the first to take advantage of Tennessee’s Military Spouse Licensing Law, enacted in early 2016, which grants a Tennessee law license to military spouses who are licensed in another state.